Kaafiri Kariuki is a Kenyan artist, musician, entrepreneur and family man who believes his art should tell stories about Kenyans’ everyday lives. Yet the lives he’s most concerned with revealing through his art are not the rich and famous. His art is meant to redeem and reveal the lives of ordinary Kenyans, especially those who work hard and struggle against monumental odds, yet who still manage to survive. Thus, Kaafiri favors drawing Kenyans for whom hope, courage, resilience and a vision of a better life are the means that keep them alive. Their successes may not seem monumental. One might be that of an able-bodied mother of five who carries all her children on her back. Another could be a child whose head is buried in a precious book which the artist identifies as key to that little boy’s future hope. But the detailed attention that Kaafiri gives to each of his paintings, (artworks which are actually delicate drawings delineated with what he calls his ‘dancing pen’) gives each work a majesty that allows the observer to recognize the individuality of every character in his art. That is certainly the case with all 21 artworks that Kaafiri includes in his current exhibition running at the Hillpark Hotel on Lower Hill Road in Nairobi. He’s an artist who also has an affinity for African history as one will see in his frequent reference to certain sacred symbols found in ancient Egypt, such as the scarab beetle which was once shaped as valued amulets and then traded all over the Mediterranean world. His art also reflects a broader global vision as when he draws the planet earth inside a calabash, as if to affirm the centrality of Africa in the world. 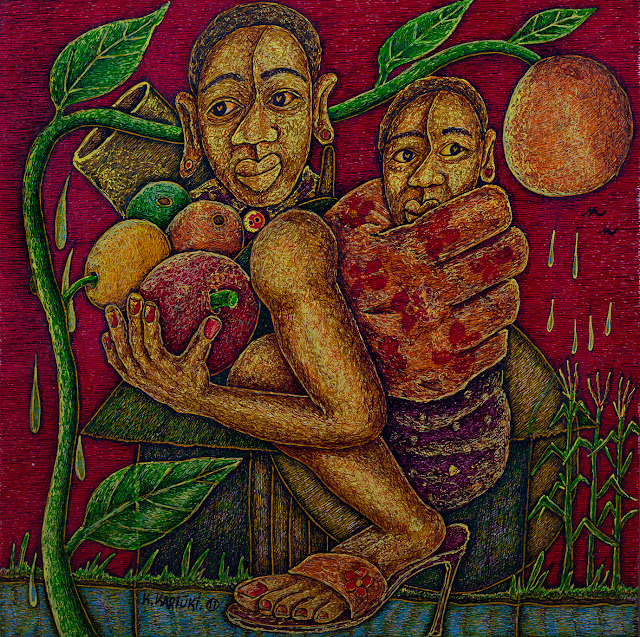 Kaafiri also believes his art ought to tell stories about certain African traditions. That is how one will find one painting in his Hillpark show featuring elders seated around a large calabash sipping an indigenous honey beer known as muratina. Yet even as some of his paintings reflect life in the rural countryside, others reveal the lure of the urban life. In one of his more recent works, Kaafiri pays close attention to designing a bountiful fruit and vegetable market where a young woman is busy at her sales. Yet in the distance one can see the Nairobi skyline with its evocative skyscrapers, the sort that entice millions of rural folk to come seek their fortunes in the big city. Kaafiri is one of Kenya’s finest visual storytellers. Yet to fully appreciate his art, one needs to study practically every detail since they all seem to have a special significance. Many of his symbols are clear-cut, but others reflect the artist’s own personal experience and evolution. It’s an evolution that began as the last born child of single mother. Cultivating his talent for music at an early age, he began earning a living playing guitar while he was still in secondary school. Yet he also discovered his skill as a portrait painter while still in his teens which eventually led to his obtaining an ad hoc art training from one university lecturer who saw his untapped artistic potential and put him to work with private studies and tutorials. 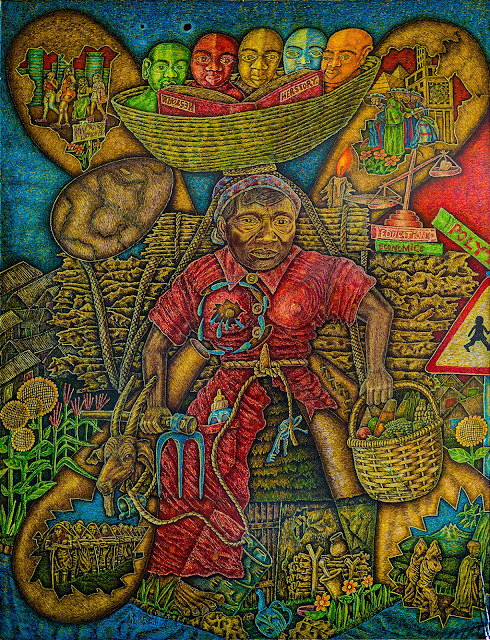 Subsequently, Kaafiri worked closely with a wide range of Kenyan artists, some at the Banana Hill Art Studio, others at the Mukuru Art and Craft Centre. He’s also worked closely with European painters and had exhibitions in France, Germany, US and UK. Kaafiri has also had a hand in mentoring a number of now-established Kenyan artists, especially those who have come from as humble of backgrounds as his own. In future, he hopes to establish a contemporary Kenyan art trust which will offer local artists a broader platform from which to both develop and expose their artistry to the wider world.